“No Stephanie. No! You’re doing it wrong. You’ll never make it to point.” I could feel my lower lip starting to tremble. I’m pretty sure that was my face’s first-ever experience with the infamous pre-cry quiver. I was six. My mom used to love telling this story. “As soon as her ballet teacher said that to her, I thought ‘oh no, here we go,'” she’d say. “My punkin does not like being told, ‘No. '” And sure enough, and as always, she was right because almost instantly, I started to cry. Thankfully, my skin’s thickened up from the prosciutto-thin slices it was then to the leather-hide toughness it is today; my aversion to the word ‘No’ however, is alive and well and since that fateful ballet class been one of my greatest motivators in life. Not because it traumatized me – although I’m sure my six-year-old self would say otherwise – or because it made me insecure or negative – although I felt about two centimeters tall that day – but because in that moment, I came face-to-face with tremendous self-doubt. Dressed in a pink tulle Tutu and a bun tightly propped directly on top of my little head, I made up my mind that I would never let anyone or anything make me feel that way again. I was only six and it was just a beginner’s class, but those sweet early years are the most formative. I learned quickly that if I didn’t create a direction for myself and define and uphold my values and sensibilities and commit to it all, that no one would do it for me, and I would surely lose my balance — in ballet and in life. It may seem negative or counterintuitive to be fixated on the most negative word in the dictionary, ‘No,’ but I choose to see it differently. 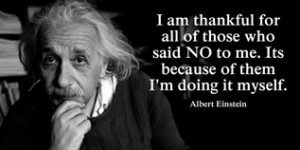 It’s the perceived power behind a ‘No’ that’s always driven me to rise above it. And someone once told me that words are only powerful if you assign power to them. I suppose the more acceptable philosophy by society’s standards would be to take a more positive approach to navigating life. After all, it takes less than 20 seconds online to be hit with a smorgasbord of inspirational quotes telling you to “Come from a place of ‘YES,” or “Just say ‘YES,” or “YES, you can!” And if that is what works for you, great! A phrase that’s always served me well, however, and one I think important to remember and try to apply in all aspects of life, and yes particularly in PR, is that there is more than one way to skin a cat. This strategy just happens to work for me. So, I slid on my ballet shoes day after day for years until I graduated to point and danced my heart out for the next three life-affirming years. Turns out, I wasn’t doing it “wrong.” I just needed a little practice. I tightly laced up my Converse and tumbled into cheerleading tryouts at a brand new high school my senior year despite the coach’s warning that locals wouldn’t take kindly to a new girl thinking she could take the spot of someone who’d been here all her life. I made Varsity that year. I dug in my stilettos (wedges and flats now really) and pressed on past those who told me that I’d never be able to sign that client in Hollywood and much less take him to a different agency. Well, I did and I did. When Emmy magazine told me a story just wasn’t going to work this time around for my biggest TV client in the middle of our Emmy campaign, I called them every week for two months, each time with different angles, until I think I just wore them down. I secured a two-page spread for my client, including his house and two dogs. Not long afterwards, Viacom made me an offer to go in-house. My friends and colleagues at the time suggested I not risk losing everything I’d worked so hard for at the agency. I’d just been promoted and successfully running my own division. What if I didn’t like it? What if it was too hard? The fears and questions played on a loop in my head for weeks. Then, I remembered that everything I’d ever achieved and was proud of was the result of me pushing myself out of my comfort zone and taking risks. Viacom was a scary step, but it was no different. I took the job and learned more in two and a half years than I ever could have imagined. When I turned 36, I found myself single and married to my job. I was exhausted and disillusioned by the idiot parade that is dating in Hollywood. I remember thinking, “Well, I guess this is it. It’s not so bad. I love my friends. I love my job. I don’t need anyone.” I met Chris, my now husband, four months later. With the death of each parent, I found myself deep inside a blackhole with just a pin prick of light. The ‘Nos’ and the darkness were relentless. There were days when I never thought I’d recover, much less ever be the same. I was partly right. I did recover but I wasn’t the same. With each death, I grew stronger than before. I guess you see my point. If I’d heeded every ‘No’ along the way, I wouldn’t be the complete, self-assured, ready-for-anything person I believe myself to be today. Who knows where or who I’d be. Undoubtedly, on a different path potentially somewhere wondering “What If?” Like a Choose Your Own Adventure book, LIFE is difficult and full of infinite twists, turns and curveballs; but if you open your eyes and really pay attention, you’ll see that you have the option to turn to page 10 and recognize that you always have a choice and can strive to be the captain of your own ship, or turn to page 15 and let other forces and people determine your fate and aimlessly sail the waters of this big, crazy world endlessly waiting for a sign. You can accept that ‘happiness and success’ aren’t just two buddies that you’ll meet one day, after hoping and wishing for them to appear. They slowly begin to reveal themselves to you after you’ve been working so hard to find them that you almost forgot what it was you were working for. And like any friendship, it requires even more work still to keep them in your life. So, that’s what lights up my ambition and motivation. What does it for you? Which page will you turn to?